It was the picnic I had been looking forward to since I conceived it four weeks after Mark left for the summer. As soon as he got back, we'd go to the beach. Fog or shine, we'd go to the beach. We'd walk a long way down to the bluffs and away from the hoi polloi. We'd picnic on Mark's first taste of Boccalone and a bottle of very special French rosé we bought at Kermit Lynch six months ago. We'd gaze at the water and digest our food. Then we'd fly a kite. 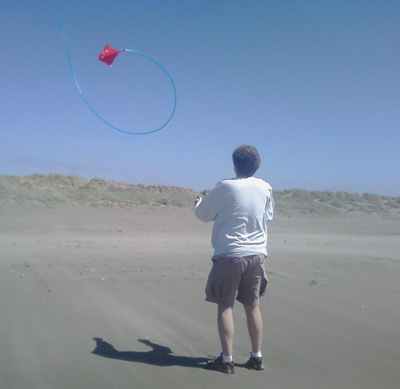 A stunt kite. A Peter Powell stunt kite Mark flew with his dad at the Outer Banks when he was a kid. That was the carefully laid plan. We did complete every last part of that plan. But there were a few unplanned turns. After picking up the Boccalone box and cheese from the Ferry Building, I put on "Let's Go Fly a Kite" from Mary Poppins, and we (read: Mark) decided to take a new route to Ocean Beach via the Presidio. Let's just say it took longer than expected. We got to the picnic bluff I had picked out months ago and made camp among the ice plants and grasses. Mark smoothed out the dark red Stanford stadium blanket, and I unpacked our picnic. Problem 1: I brought the wrong bottle opener. It broke the cork in half while it was still in the bottle, and we finally gave up and just shoved the rest of the cork down the bottle neck. Problem 2: There was enough wind to fly a Peter Powell stunt kite. Problem 3: More than enough. I opened up the farro-lentil salad and was about to raise the first bite to my lips when the wind blew a fine (but effective!) sheet of sand right over us. We had a few slices of Boccalone before they, too, were be-sanded. I was slightly sad but glad I had a reason to avoid eating vaguely intestinal-like grey pork loin terrine thingy. What the hell was that, anyway?! I'll tell you what it was, it was a TEXTURE VIOLATION! Like, in the worst way. Yeeech. We turned our backs to the ocean and the sand and tried to eat a few more things. Like olives. We decided not to open the Red Hawk cheese. We drank our wine, lost a spreading knife, and decided to break camp. By this point, we were beside ourselves laughing. Mark got up to shake out the blanket, and I got up to put my shorts and shirt back on over my bikini. Instead, I let the wild wind put them on for me. I placed my shorts at my waist and my shirt across my chest and I faced the wind. It blew my clothes on me. "LOOK!" I shouted to Mark, above the gathering gale, "I GOT DRESSED!" Mark turned to see me, dropped the blanket in the sand again, and doubled-over laughing. "THIS IS A NICE PICNIC HONEY!" he yelled back. 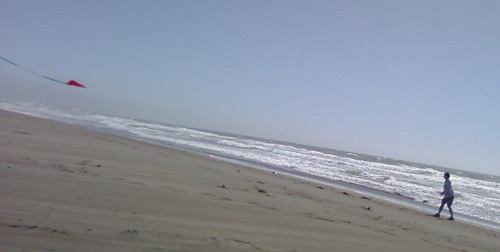 We gathered everything together and ran down to the beach, where I learned how to fly a stunt kite. The wind was just right. But there's a whole lotta sand in our apartment right now.